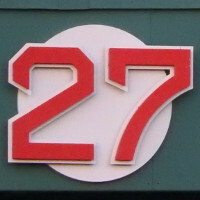 Retired May 21, 1988, for Hall-of-Fame second baseman Bobby Doerr. 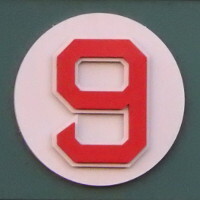 Retired May 29, 1984, for Hall-of-Fame shortstop Joe Cronin, who also served as Red Sox manager and GM and American League President. 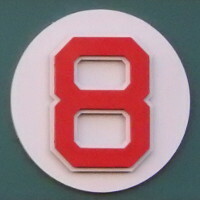 Retired September 28, 2008, for shortstop Johnny Pesky, who served in the Red Sox organization for 61 years as a player, manager, broadcaster, coach, and special instructor. 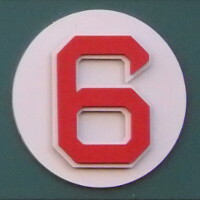 The whole team wore number 6 on 8/21/2012, in memory of Johnny Pesky. 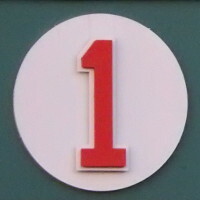 Retired August 6, 1989, for Hall-of-Fame left fielder and first baseman Carl Yastrzemski. 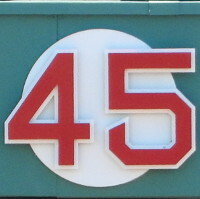 Retired May 29, 1984, for Hall-of-Fame left fielder Ted Williams. 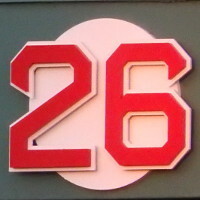 Retired July 28, 2009, for Hall-of-Fame left fielder Jim Rice. Retired May 26, 2016, for Hall-of-Fame third baseman Wade Boggs. 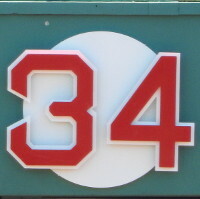 Retired September 4, 2000, for Hall-of-Fame catcher Carlton Fisk. Retired June 23, 2017, for designated hitter David Ortiz. Retired by all teams on April 15, 1997, for Brooklyn Dodgers Hall-of-Famer Jackie Robinson, who broke baseball's color barrier. 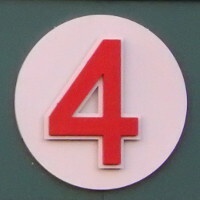 * Hale, Crisp, and Ortiz wore number 42 on 4/22/2007 to honor the 60th anniverary of Jackie Robinson breaking baseball's color barrier. 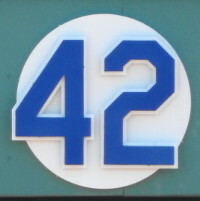 All three wore number 42 again on 4/15/2008. 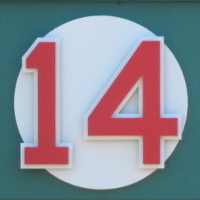 Retired July 28, 2015, for Hall-of-Fame pitcher Pedro Martinez. This page copyright © 2000-2019 by Kristen D. Cornette.